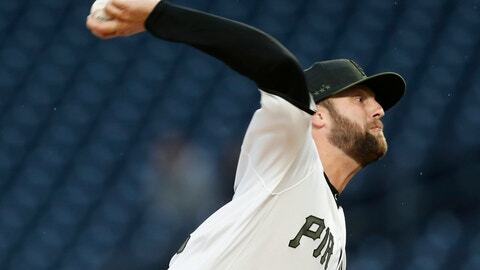 PITTSBURGH (AP) — Jordan Lyles became the latest Pittsburgh starter to open the season with a stellar effort. Lyles threw five effective innings in his Pirates debut, a 2-0 win over the Cincinnati Reds on Thursday night. Lyles, who played for San Diego and Milwaukee last year, allowed three hits, walked three and struck out two. He was activated from the injured list before the game after being out with discomfort on his right side. Through five games, the Pirates starting pitchers have allowed an MLB-low five runs and hold a 1.55 ERA. Despite extraordinary starting pitching, the Pirates improved to just 2-3 this year. The Pirates’ bullpen blew back-to-back saves in two games against St. Louis and had a 5.79 ERA entering play Thursday. But Nick Kingham, Richard Rodriguez and Felipe Vazquez combined for four scoreless innings as the Pirates recorded their second shutout of the season. Kingham (1-0) pitched two innings of relief, conceding two hits and striking out two. Rodriguez bounced back with a shutout inning after being scored upon in his first two outings of the season. Vazquez escaped a two-on, one-out jam in the ninth to earn his first save of the season by striking out three. “It was well-executed game plan by our pitchers and they all deserve some credit,” manager Clint Hurdle said. With one out in the seventh, Melky Cabrera singled and was replaced by pinch-runner Pablo Reyes. A single and Kevin Newman’s infield dribbler back to pitcher David Hernandez (0-1) made it 1-0. Cabrera finished with three hits. Reds starter Tyler Mahle threw six scoreless innings in his season debut. He allowed five hits and struck out five without a walk. Both of the Pirates shutouts have come against Cincinnati, and the Reds have been blanked three times in total on the season, including two straight games as they lost 1-0 to Milwaukee on Wednesday. They managed six hits against the four Pittsburgh pitchers and went 0 for 4 with runners in scoring position. The Reds are hitting an NL-worst .169. Center fielder Scott Schebler, who went 1 for 3 with a double and a walk, agreed with his manager’s assessment. Reds: RHP Sonny Gray (0-1, 6.75 ERA) will make his second straight start against Pittsburgh on Friday. Gray lasted just 2 2/3 innings and allowed three runs against the Pirates in Cincinnati on Sunday. Pirates: RHP Joe Musgrove (0-0, 0.00) will make his first start and second appearance of the season. He pitched two scoreless innings of relief against the Reds on Sunday.